Aloo Tikki with besan better serve this delicious recipe as a starter or can be serve at tea-time with the sauce or chutney of your choice. 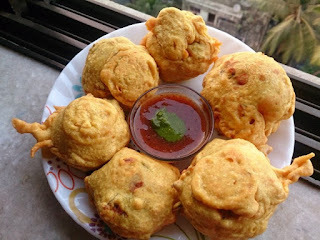 In Mumbai and rest of Maharashtra this recipe is called Batata Vada. In south, it is called Potato Bonda. Boiled and mash the potatoes in a bowl, keep aside. Add chopped onion, green chilli, jeera powder, chat masala and some salt in mashed potato and mix well keep aside. Take the besan in deep bowl add some salt, a pinch of turmeric powder red chilli powder rice flour and add some water and mix well for make a slightly thick better.